I’ve been working on a series of articles on the threats to activists, independent journalists and innocent bystanders targeted by trolls that lurk on the web. This has led me to some of the shadier corners of the internet: the fabled DarkNet. The research phase of looking into DDoS attacks has already made me tape over the camera on my laptop and run repeated anti-virus scans on my computer, every damn device attached to my home network, and my external hard drives. Paranoia is just the entry fee for this fun game. I’ll have a lot more to say about this subject in upcoming posts, but for now, please enjoy these screenshots of actual, real-life haxx0rz selling the services of their botnets. For as little as $2 a day, you can blow up someone else’s server. 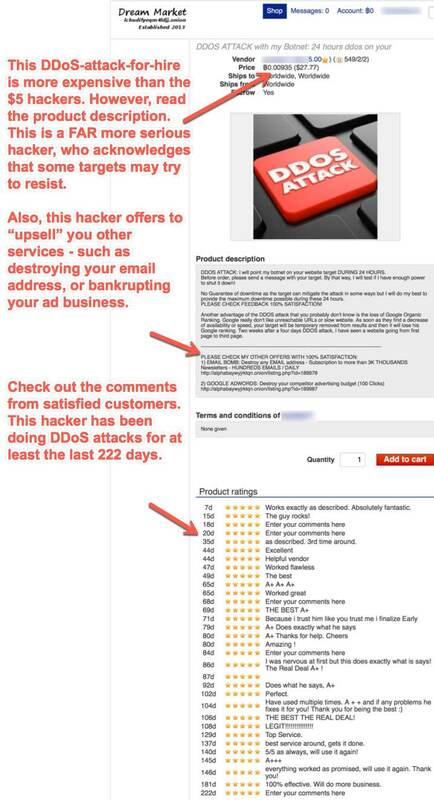 Or you can pay a little more for a haxx0r who has lots of positive feedback, and who can also upsell you some bundled Evil Services, such as killing your email address or exhausting the advertising budget of one of your rivals. 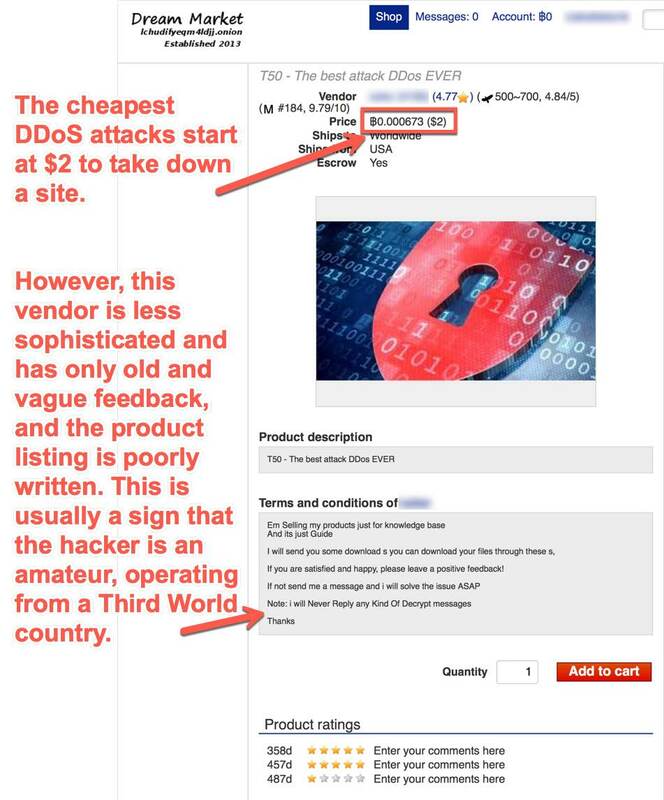 On the other hand, there are hackers who seem to have a lot more expertise. These are people to be feared. What strikes me is how pedestrian and matter-of-fact the listing is; the satisfied borrow from the language and effusive praise in the comment sections below the main product listing. It’s like a dark mirror of Amazon.com or eBay or whatever. 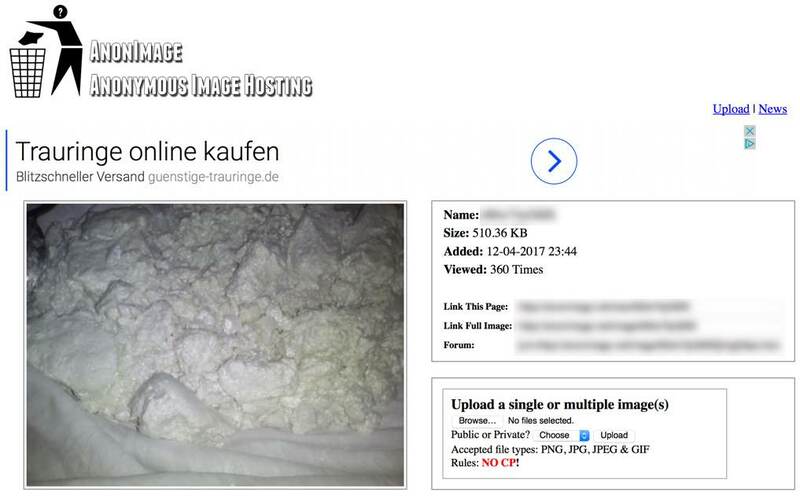 Well, here are some of the other product listings on the DarkNet: pounds of pure, uncut cocaine. For sale. Got enough Bitcoin, and you can buy just about anything you want, anywhere in the world, and have it brought to your door. Is this a good thing? Probably not. But it is a thing. And we’re going to have to learn how to deal with it.